While a bassinet might not seem like something necessary for new parents to purchase as their baby might outgrow it in a couple of months it is, in fact, a wonderful purchase. Bassinets can help several needs like establishing a sleeping routine in new babies so that not only babies get to sleep throughout the night, but parents can too, and this makes bassinets a necessity to have around. A bassinet for newborn babies is much like being swaddled. 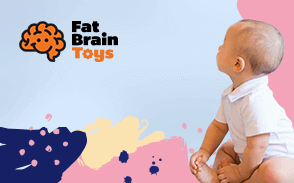 They can reduce overstimulation and help keep your baby nice and cozy while they try and sleep. It will give new parents and their baby a bit of a break so that everyone will be able to get rest. Everyone deserves a good night's sleep. Make sure your baby is getting just that by picking a bassinet from Borncute's latest top ten upgrade! For this update, we focused on improving our introduction section in order to correct various spelling and grammatical errors. We also updated our criteria to better reflect current safety and health information that is now available. Rock 'n Play Portable Bassinet from Fisher-Price is a comfortable, safe place for baby to nap and sleep with some wonderful extra features. The flat, elevated sleeping surface is great for settling down for a soothing nap when it’s in the rocking mode. Just a gentle push starts the rocking action. 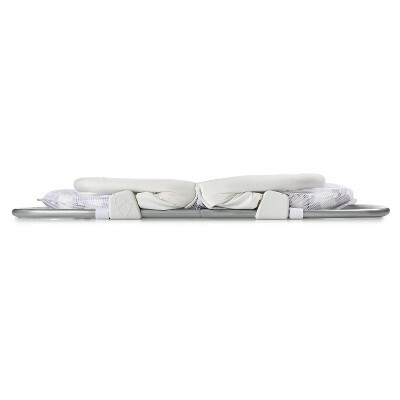 With a twist and lock of the feet, the bed is stable and perfect for a full night’s sleep. 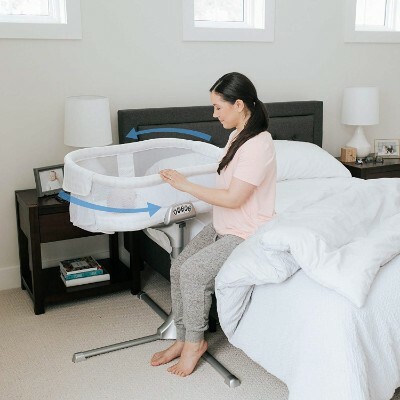 A bassinet that comes with its own entertainment center, the Rock ‘n Play has a mirror, a soft rattle and soft linkable toys attached to the back wall. Baby can explore and have fun or use them for self-soothing and exploration of different textures. The lightweight structure is sturdy and easy to collapse for travel or moving from to room. This is a great comfortable sleep environment that is portable and easy to pack and store or set up safely. The mattress pad (included) is machine washable and dryer safe. 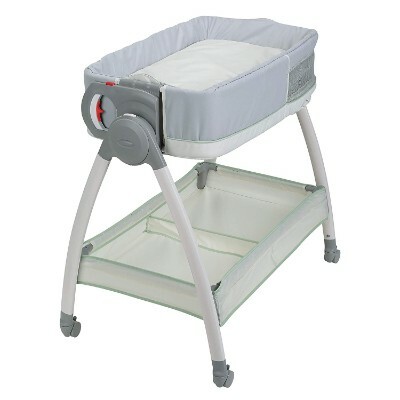 A versatile piece of baby gear, this Rock ‘n Play bassinet provides baby a safe place to sleep. Whether you use while traveling or in the front room, baby will stay cozy. The mesh sides mean that parents can keep a watchful eye on baby. Overall this great product is a favorite with us and parents. The Rock ‘n Play has a very simple yet functional design. And with a name like Fisher-Price, quality is a given. The Rock ‘n Play can sit right next to mom and dad’s bed all night long with a good view of baby through the mesh wall. Comfort is close by and baby is easy to reach. This sleeping unit is so light and easy to move that you can take it along for travel or fun anywhere. Set up is a snap and you’re bringing along toys without adding any extra weight. 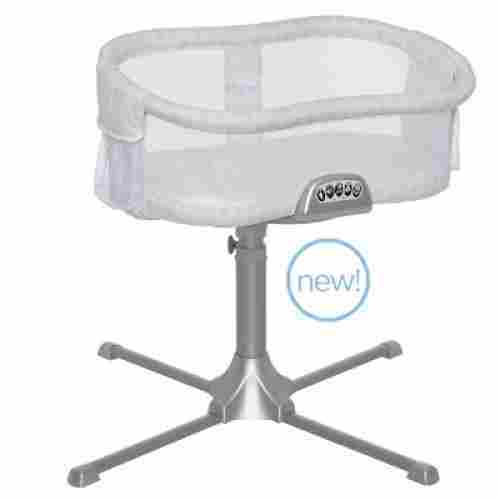 Rock ‘n Play Portable Bassinet is a great bargain but remember, it’s for use with infants and babies who are not yet able to push up on hands and knees. When they reach this level of development or learn to sit unassisted and pull themselves up, you must consider them too big for this or any other bassinet. Maximum weight is 25 lb. For effortless bedside baby care, you’ll need Graco’s Dream Suite. It serves both as baby’s specialty bed and changer rolled into one. Moms simply have to push a button, flip the Dream Suite and the underside becomes the changer. Sending your baby to sleep is also made a lot easier with its 2-speed vibration function. The canopy provides adequate protection for baby’s eyes while also serving as attachment to plush toys that can be dangled overhead to keep your infant entertained while he or she is awake. There’s also a storage compartment underneath so you don’t have to worry about getting a separate storage bag for your young child’s things. 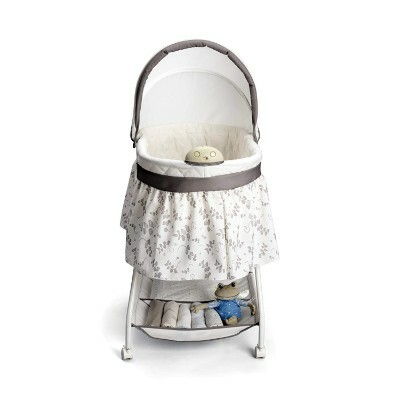 Graco designed this bassinet to be the one piece of gear your baby uses in the first couple of months. Part bassinet, part changing pad it is meant to be used longer than many items on this list. This is a great bassinet for parents who don’t need a travel sleeper and would like the additional features/storage. Changing your baby’s diapers has never been this easy. At least, there’s no need to bring baby from the Dream Suite all the way to the changing area. You can do it right on the Dream Suite. The system easily yet securely locks into position so there’s no danger of your infant falling whether he or she is sleeping or his or her diapers are being changed. It has a very sturdy A-frame that connects to fully lockable wheels. Buying your child a bassinet may seem like an unnecessary purchase but nothing could be farther from the truth. As an infant, your baby is used to the sounds, smells, and feeling of being inside your womb and attempting to transition them to an open crib shortly after birth may actually frighten them. A smaller sleeping area, though it seems uncomfortable or tight to adults, is the perfect way for your swaddled miracle to sleep peacefully. It is also useful in keeping your baby nearby for their inevitable middle of the night feeding needs. With the Graco Pack ‘N Play Playard, you are getting not only a bassinet but also a changing table, a napper, and a playpen. The versatility of this product ensures that it will be more than just a bed they use for a few weeks or months but will grow with your little one well into their toddler or even preschool years. The bassinet is removable so it can be placed on or near your bed or travel with you for that first visit to grandma and grandpas. The pack n’ play features a push-button fold design that can be easily manipulated with one hand without having to put your baby down. The bassinet and changing table portion of this play yard have been specifically designed to support newborns up to 15 pounds and then transitions into a napper for babies less than 3 months old. Versatile and convertible, this pack ‘n play is much more than just a bassinet and will quickly become your go-to for out-of-home sleeping for much of your child’s first few years. Can’t be used past 15 lbs. Ready to go whenever you are, the Brica Fold N’ Go Bassinet is a truly portable version of the bassinet. Unzip the handy carrying case, open up the tubular steel frame and “double lock” the joints into place. The Safe-T-Lock System has a unique four-point security feature that ensures your baby is protected and contained. The clever design uses breathable fabric throughout creates some protective shade with mesh panels between to allow mom and dad to keep an eye on baby while he or she is sleeping or relaxing inside. This lightweight fabric and open frame also create good air flow for breathing and comfort and a sealed padded mattress give just the right amount of soft support for baby’s naps. The Brica Fold N’ Go meets ASTM standards for home bassinet use and is the only travel bassinet that can make that claim. 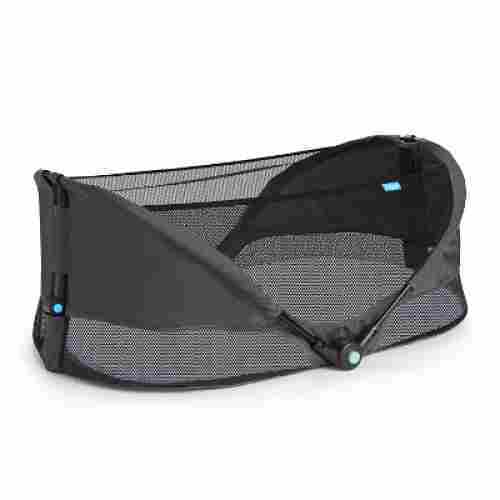 This travel bassinet has everything baby needs to sleep on the go. Its fold flat design even has an attached handle for carrying convenience. When it’s time to rest the locking feature and mesh sides keep baby sleeping safely. This makes a great choice for parents that plan to travel while baby is young. The innovative lightweight design is something worth mentioning. But what really impressed us was the Fold N’ Go’s patented lock system so that the whole cradle stays in place no matter what surface you lay it down on. The Safe-T-Lock System uses a double-locking tubular steel frame with a special dual release mechanism. This guarantees your baby’s fingers and toes will never be trapped between the steel frame pieces while it the bassinet is locked open. When you’re ready to go home, the process reverses with little effort and the frame can be easily collapsed and packed for compact, lightweight carrying with its own handle. This product is made of polyester, steel, and machine washable cotton. The Premier Swivel Sleeper has several features in common with the hospital version for newborns. This one is especially great for mom’s who have had C-Sections and need to avoid carrying baby around. So much convenience in one item, the 360 degree swivel, and stable caster base make this an all-purpose, easy to use bassinet. Especially great for mom’s recovering from a C-section or any postpartum complications. This bassinet on wheels swivels and rotates a full 360 degrees, making it easy to access baby from any direction. It’s an ideal choice for nursing mothers who need quick and easy access to baby in the wee hours. 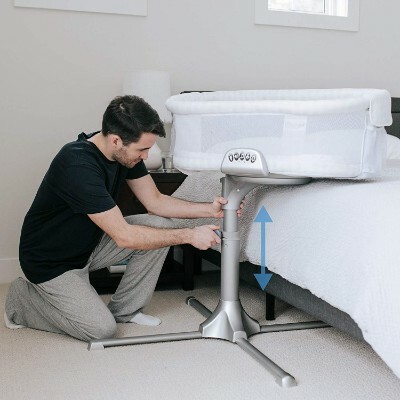 The stable 4-point base easily adjusts in height and the wheels can slide right under the bed, putting the bassinet anywhere from the edge of the bed to right over it. The side wall lowers to make it easy to get to baby using a minimal amount of movement and without getting out of bed. A Back to Bed Reminder gives mom an alert when it’s time to put baby back in the bassinet after feeding. The Premier Swivel Sleeper also has a nightlight and music with 3 lullabies, 3 comforting sounds and volume control. There are 2 levels of soothing vibration and all of these (sounds/nightlight/vibrations) have a 30 minute auto shut off all powered by 3 AA batteries (not included). The waterproof polyurethane mattress pad (included) has no toxic flame retardants and has a 100% polyester fitted sheet. The Swivel Sleeper can be used for babies up to 5 months old but only until they begin rolling over or pushing up. The bassinets will wipe clean with just a damp cloth and sheet can be machine washed. 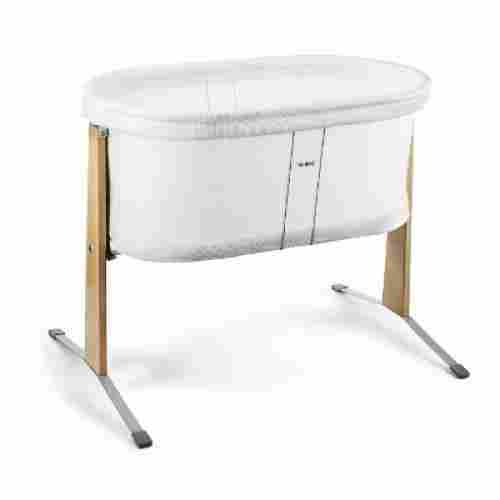 Great for small spaces, at 24" to 34" tall this bassinet works with almost any bed and requires only 32" clearance from the wall or any obstruction. There are 2 storage pockets for keeping lotions and diapers, baby wipes and all the necessities near at hand. CPSC tested independently and JPMA certified. Also meets Health Canada safety standards for bassinets. While having a ton of customization and versatility can be beneficial for any children’s product, sometimes it's best to avoid all the extra bells and whistles. Simple and easy-to-use performance can outweigh commodities and no bassinet provides ease of use like the BabyBjorn Cradle. This beautiful cradle has been designed specifically to provide an easy-to-use and highly portable sleeping option for your newborn. 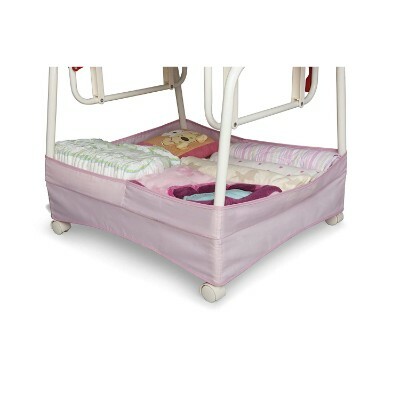 These bars provide extra stability for this lightweight bassinet. They also allow for a gentle rocking motion to start from your baby’s own movements, helping to simulate the conditions of the womb. Since it weighs so little, it is easy to move from room to room, keeping your child with you as you go and can also make an ideal travel crib. Simple, clean aesthetics make this cradle not only a practical but also a beautiful addition to any nursery. Simple yet elegant, this cradle has no bars or loose parts in which your little one’s hands or feet could become trapped. The breathable fabric is perfect for babies who side sleep as the mesh material allows air to pass through all parts of the fabric, eliminating suffocation concerns. 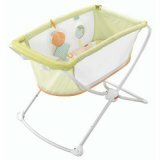 This cradle has a much higher weight rating than similar bassinets and can be used up to 6 months or 17 pounds. The cradle fabric is removable as is the waterproof mattress cover and both can be machine washed for easy cleaning. It stands sturdily on two wooden legs that are connected to steel rocking bars. It is made of highly breathable mesh fabrics and has a polyester padding for maximum comfort and safety. Delta Children’s Classic Sweet Beginnings Bassinet is a beautiful, traditional design with some terrific modern updates. An adjustable, removable canopy makes it easy to give baby shade or protection from unwanted light during the day. This gorgeous bassinet combines old fashioned aesthetics with modern features. With a locking castors at the base, you’ll easily be able to move baby around. While some features like the music player are meant to keep baby comfortable, others are for parents. An example is the night light. Those late night feedings are far easier with a soft glow to work by. 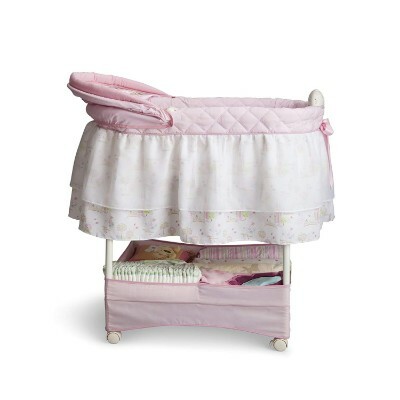 A delicate skirting gives this bassinet an elegant, old-fashioned look. A surprisingly modern feature is the small night light at the foot of the bed. This is a wonderful new innovation that makes it easier to take care of nighttime changing and feeding without turning on harsh overhead lights or looking for a lamp in the dark. Another technological convenience is the electronic music module which can provide soothing sounds to comfort baby to help him sleep or simply to add sensory stimulation. 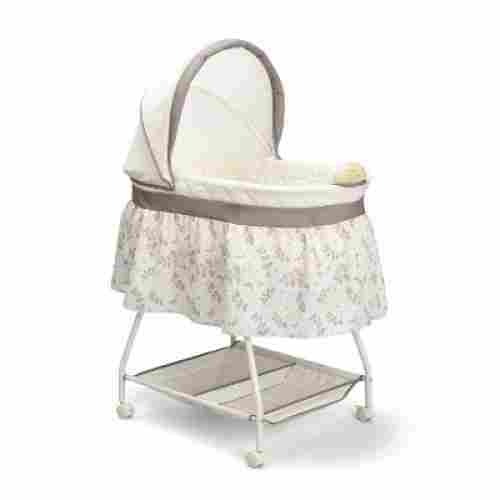 The Classic Sweet Beginnings Bassinet is designed for infants up to 15 lb. using a sturdy steel frame to support this soft, elegantly trimmed sleeping area. The polyester fiber pad (included) with a fitted sheet and cover skirt are machine washable. The entire bassinet can be moved around on locking swivel casters. Unlike a crib, this design allows you to move a sleeping baby anywhere in the house without being disturbed. There is ample storage in a large basket below for extra diapers, blankets, clothes, bibs and other baby items. Conveniently lightweight, this bassinet can be easily collapsed and for quick storage and every part of the construction is JPMA Certified, exceeding ASTM and applicable CPSC Standard. 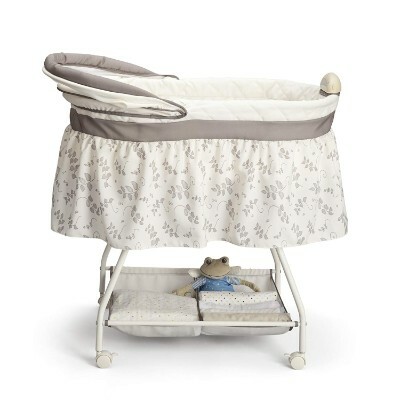 The Sweet Beginnings is one truly amazing bassinet for infants. It’s affordable and with some unique features, we are pretty sure this is a great buy. The SwaddleMe By Your Side Sleeper is the perfect bassinet to address all safety concerns in bed-sharing with an infant. Baby is right there all night, safe within a soft cocoon. Mesh sides provide a perfect view and allow air to circulate and cool baby. The sturdy metal frame is covered in soft fabrics to provide comfort and the sleeper includes both mattress pad and a fitted sheet. This is a great item to take to the park or the beach for safety and convenience. 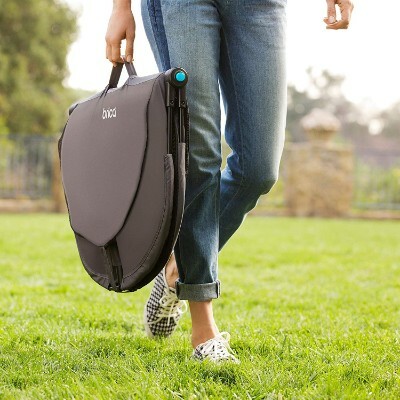 The frame quickly folds flat for ease of storage and for traveling. The SwaddleMe is small and light and works just as well in a hotel bed or at the grandparents’ house. 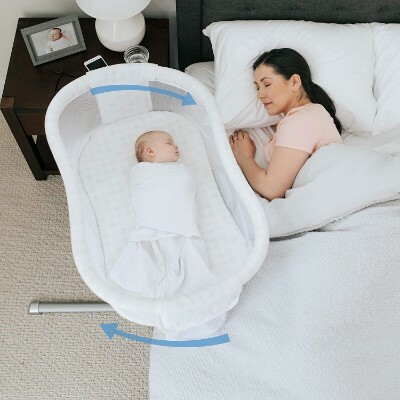 This bassinet puts your child within reach all night long and the soft sides are made to allow easy access to soothe a fussy baby or adjust blankets and clothing without much movement. It’s easier to carry around than a bassinet with legs and has the added benefit of nestling between both parents rather than on one side of the bed or the other. We love the portability of this bassinet and it’s perfect for parents who want equal access for mom and dad. If baby is between mom and dad it doesn’t matter who does the comforting, only that baby is happy. The SwaddleMe By Your Side Sleeper is appropriate for newborns and for the next few months but only until they are able to push up or roll over. It is well constructed and JPMA Certified, exceeding ASTM and Applicable CPSC Standards. If you’re at all nervous about keeping a steady watch over baby throughout the night, a bassinet is just the right ‘beginners item’. It is a great solution for sleeping with your baby before he or she grows into a crib. 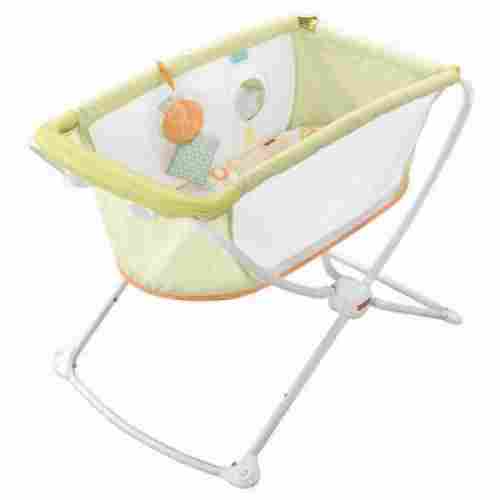 This bassinet is great for families that want to keep an eye on baby wherever they might be in the house. It moves easily, locks into place, and comes in an adorable Disney Princess theme. 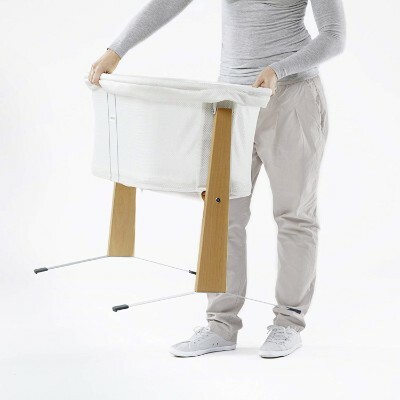 Made to be mobile, this little bassinet easily transports from room to room. It features lots of storage space, locking castors, and a removable canopy. In a darling Disney Princess design, it's sure to brighten up any room. It glides side to side and features vibrations as well as a nightlight. 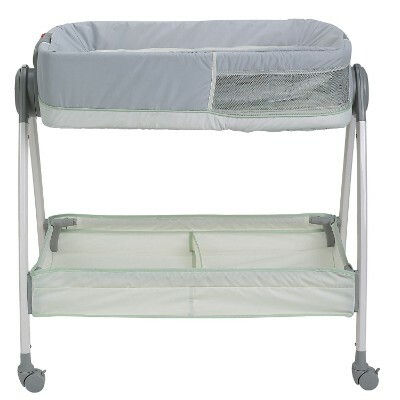 The bassinet frame measures 18 by 34 inches when assembled and requires four AA batteries. It has two large storage sections for baby's essentials and can support children up to fifteen pounds. With locking casters to keep the bassinet stable and a removable canopy to provide baby both shade and ventilation, this little bassinet is a solid choice when it comes to baby's comfort and safety. The Lullago is one of Chicco’s bestsellers. It features easy Snap-On high-grade metal legs in a stable and sturdy A-frame design. This makes it super easy to assemble as well as disassemble. 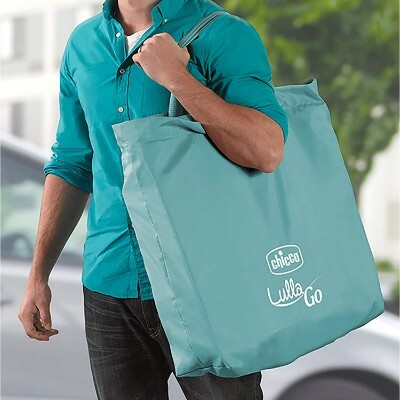 The system also allows for ease of storage in its accompanying carrying bag. Once fully set-up, the Lullago can be your baby’s mobile crib wherever he or she may go. All of the fabric components of the Lullago can also be machine-washed so it should not be difficult to clean. Chicco designed this travel crib to mimic the roomy environment of a standard crib. The size means that though it’s not the most portable on the list, it will last you longer than some others. The frame locks together and is meant to be set up in a minute. 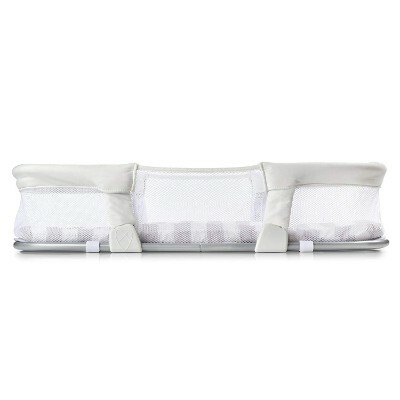 With this travel crib you’ll be able to keep baby close while away and at home. 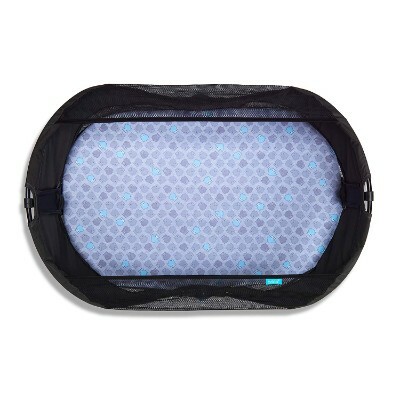 The mesh side panels allow air to move freely in and out of the travel crib while its padded mattress provides added comfort for baby’s restful sleep. Chicco is one of the most trusted names in baby products. The Lullago’s Snap-On system is remarkable making it easy to setup and disassemble in under 60 seconds. While it’s important for babies who can’t exactly pull themselves up, yet bassinets are wonderful gear parents should have. It is recommended that babies under four months of age are placed in them. The bottom line as well as the difference in price. While of course, parents want something that their new child is going to be able to use over time, a bassinet also will help a parent bond with their baby and keep them in with a snug fit until they can get used to a crib. Always look for a trusted seal such as the ASTM as well as the JPMA. 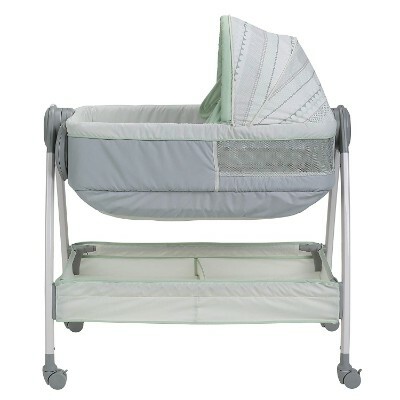 Always choose a bassinet with a wide and stable base as well as a sturdy bottom. Check the sleeping pad or mattress; this should be extra-firm yet smooth. Always choose one with mesh side panels to prevent suffocation. Make sure you understand your baby’s developmental needs. As soon as he or she starts pushing himself or herself up, then it’s time to say goodbye to the bassinet. Always check the security of the unit’s folding mechanisms. Make sure these locks into place. As always, we suggest only using with approved accessories. Another important consideration is that though each item has a weight limit, a bassinet’s ability to be used safely relies more on the stage of development than weight. Bassinet use should ALWAYS be discontinued once baby can push himself/herself up. 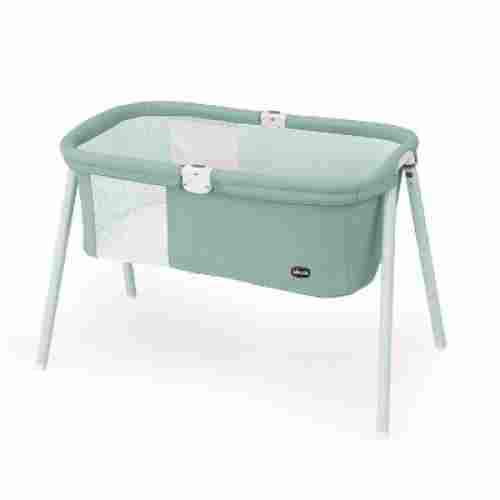 Bassinets are a great item to make that first couple of months easier. Select a safe one, use it as directed, and allow our list of top 10 bassinets to be your guide. One other thing that we considered when coming up with our list is how easy the product is to use. We know that parents – especially new parents – need baby gear that is easy to use and will make their lives a little bit simplified so that they can get a few good hours of sleep before having to start their day over again. We know that choosing the right bassinet for your baby isn’t going to be an easy task. With so many options in today’s market, we wanted to make sure that we came up with the best ten that would also help save you spending hours of research. When choosing the right bassinet for our list, our main concern, of course, was safety. Newborns need a sturdy, secure place to sleep which made it easier for us to narrow down our list when it came to safety criteria. We looked at safety-compliant certifications on each product that’s listed above. These specific certifications are only awarded to products that are not only built to a specific standard but are also tested. We are also well aware that when it comes to shopping for bassinets that parents often will go towards well-known manufacturers. It’s important to go to well-known manufacturers not just because of the reputation they’ve established along the way but because of their overall customer service. We did include a few of these on our top ten list a few lesser known brands as they had wonderful features and surpassed our safety standards. q: Can I add a pad to make the mattress more comfortable? No. Unfortunately, bassinets are certified safe for babies only when used with the included mattress. q: How do I know which sheets will fit my bassinet? The best way to know is by comparing the dimensions of the bassinet mattress with the sheets you’re interested in. Some manufacturers include a sheet with the bassinet. q: Could I use the travel bassinets in a bed as a co-sleeper? Yes! If you plan to use them in bed, keep the dimensions in mind. Some beds may not be wide enough to fit a travel bassinet comfortably. q: Do I need tools to assemble the Graco Dream Suite Bassinet? No. The bassinet was designed for easy, tool-free assembly. q: Will the Halo fit in small spaces next to a bed? It may. The Halo was designed to be versatile even in small spaces. Since the feet can slide under a bed, it may be perfect for your room. View the dimensions to be sure. q: Why does the SwaddleMe have compressional mesh sides? The manufacturer knew that parents would be reaching in to comfort the baby throughout the night. The sides are designed to make that movement comfortable so that everyone can get more sleep.